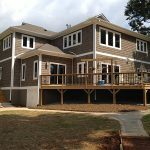 We Have Been Doing Guest House Renovations for Over 30 Years in the Lake Norman & Mooresville, NC Area. Guest House Renovations in Mooresville & Lake Norman – Imagine this scenario: Your parents or in-laws surprise you with a phone call saying they are coming to visit. You soon find yourself frantically clearing out a space for the air mattress in the den, or rearranging which child is sleeping where in order to make space for them. Perhaps it’s time you stopped using the guest house as a storage shed and renovate it so you have a place for friends and family to stay with less inconvenience for you, and your kids don’t have to fight over which bed they get to sleep in when Grandma and Grandpa come. Here at Chad Goodin Signature Homes, that is exactly what we can do. Leave your guest house renovations up to us, and watch your idea become a reality as we listen to you, create what you want, and execute the plan according to your ideas. Located in Mooresville, North Carolina, we have been doing guest house renovations for over 30 years in the Lake Norman area. We know what works and what options to give when you have an idea in mind that you think is impossible. We can create a winning design, redo the floor plan, and make your guest house a place where anyone will enjoy staying. Best of all, after the guest house renovations are done, you can always feel like your home is still yours, even with guests visiting. From the moment we make contact, until the guest house renovations are complete to your satisfaction, Chad Goodin Signature Homes will keep in contact with you and stay committed to the project through the entire process. You dream it, we create it, and in the end, everyone is happy with the results. Trust us— your guests will thank you! For more information on guest house renovations, contact us today. At Chad Goodin Signature Homes, we proudly perform guest house renovations in Mooresville, Cornelius, Davidson, Huntersville and the surrounding Lake Norman area of North Carolina.